We are coming to the end of 2015. However, I think it is important no matter what year it is to achieve your goals. If you haven't achieved them then, you keep working at it until you do. It can be hard to stay focused on them sometimes. Life can be pretty busy and sometimes things don't go as we have planned. Our goals get set to the side or even forgotten. Our emotions go up and down as if they are on a roller-coaster ride. Fear can set in to. What if we don't achieve our goals? This is something that can plague the best of us. The key is to stay focused on them. How many of us have wrote them down only to have forgotten them. We cannot forget what we want to achieve. If we do, they will be like dreams that were once in our memories only to vanish because we didn't pay attention to them anymore. We shouldn't forget our goals. Why? Because they are too important. These are things that we can do if we set our minds to it. It's never to late to get started. Find those list of goals and start working on them so you can start checking them off the list. There is no need to wait for a new year to get started. Do not wait get started today. 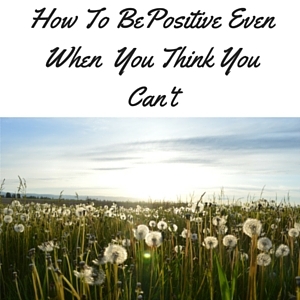 In the blog post,"How To Be Positive Even When You Think You Can't" Remember I told you that the book,"Write It Down Make It Happen" was on my list of books to get. Well, I got it. I am so happy. Because this was a goal and I was able to achieve it. Yes, it is a small goal but that doesn't matter. The important thing is I set a goal and I achieved it. In fact, I am reading it right now. I am on page 92. This book is helping me with achieving my goals. It has so many inspiring stories and it also shows you how you can do the same by writing your goals down no matter what they may be. That's what I really like about it. I know that sometimes we set time limits on our goals. That is okay to do, but don't get discouraged if you don't achieve it by that time. Just set a new time limit and go from there. Don't write your goals down and set them to the side. Look at them often. If you can at least once before you go to bed. This way you won't forget about them. I believe this is the number one reason why we don't always achieve them. It is because we have wrote them down and have forgotten all about them. Also, you must have some patience as well. The things we want are really worth waiting for. At least, I think so. I think because we are always so hasty a lot of the times we settle for things that we know deep down in our hearts are not good for us. That's why somethings that we don't get are really a blessing in disguise. For me goals aren't just about material things. It's about being a better person as well. You can set goals to be more patient. Not to get angry over stupid stuff. To do less complaining. To be more appreciative. To be less judgmental. It's nice to see how you are evolving as a person. Improving oneself also helps us to achieve the goals that we want. Of course it's a lot of work and it is continual but it is so worth it. Don't you think so? I have added another thing to my list which I think will aid me in being more focused on my goals. It is the The Simple Elephant Goal Planner. Actually, this will be my first planner. I have never used one before but I believe it will help keep the structure and the focus I need to help me better accomplish my goals. Working towards our goals gives us something to look forward to. Also, to focus on. Many times we are so focused on things that we are unhappy about that we don't focus on the things that we are happy about. Then, we wonder why we are attracting things that we don't like. Focus on your goals. The things that you want to be doing and God-willing you will be doing. So, remember no matter what year it is it's never to late to achieve your goals. Find and dust that old list of goals you have written and start checking them off that list. What goals would you like to achieve? What goals have you already achieved? Share them with me in the comments below. May all your goals come true! Feeling positive on a regular basis can sometimes be extremely difficult. After all, we are bombarded with negative images daily. Not only that, we experience things in our lives that can cause us to feel not very good. Things may not be going the way we want them to be. It can feel like sometimes that things are never going to get better. If it isn't one thing it's another. Then we dwell on these negative feelings over and over again. They just keep popping up it seems like all the time. Things continue to go downhill and we don't know what to do about it. I struggle with being positive all the time. So, I am truly writing this from experience. Today I am both, the teacher and student. :) If you're like me and you have a good memory. Having a good memory is very helpful. I love having a good memory. The only downside is that you not only remember the good but also the bad. It's easy to keep reminiscing about things that really made you feel bad. They just keep playing in your mind like a broken record player. As soon as you get that thought you think about it and all the bad feelings that came with it. This is what can keep you down. I often ask myself,"Why is it so easy to feel negative?" The only answer I can come up with is sometimes we just want to hide behind those feelings. It can be hard to face our fears. Fear is scary or so it seems. Assumptions I believe is the number one problem. When we assume things that are not true it can be about ourselves or someone else. That's how the negativity sets in. In reality you don't know. You don't know a person until you get to know them. You don't know you can or can't do something unless you try. I think you need to stop assuming and start taking action. Speaking more positive is what you want to start with. Before you even think about something negative immediately say something positive and say it out loud. For instance, if you feel like you are having a hard time writing an article immediately say you can and say it out loud. This works. I have done it. This is starting out small. You have to take baby steps. This is conditioning your mind to start feeling like you can. Many times you feel like you can't. This will help you get the word can't out of your vocabulary. This word has to go in order for you to progress in your feeling positive journey. You start to naturally feel good. Who doesn't feel good when they accomplish something no matter how big or small it is? Kelly Cooper she is the author of Live Life Made To Order. Her blog has helped me tremendously. If you are having problems with attracting the things you want in life and your feelings keep hanging you up she helps you learn how to overcome those negative feelings. She really helps you understand what the law of attraction really is and how to do it correctly. I highly recommend you read her blog. Sarupa Shah is the author of The Soul Agent. Her blog is about helping you get your money problems right. She helps you work with affirmations and gives you tips on how to use them to help you achieve your financial goals. You can join her community to get excellent tips. Another thing that can help you on your path to positivity is to keep reading books that will help motivate and keep you in that direction. I try to keep a list of books that I want to read on a regular basis. This is a book that is on my list now. I know sometimes getting structure can help you attain your goals and this book looks like it can help you do that. So, I am getting this book. I thought I would share it with you if you are looking for something that can help direct you in the right direction by keeping you motivated and giving you work to do. This way you can stay focused on your goals and achieving them and not on things that aren't going good at the moment. It's so important that we get control of our feelings. If we don't they will continue to give us pleasure or pain. I'm the first one to admit it's not easy being positive sometimes. It can be downright hard. However we must surround ourselves with positive people and also treat people the way that we want to be treated. You must do the work. You simply just can't say you want to be positive and well, not work on being positive. It can be done. People do it all the time. Changing from negative to positive is awesome! Change your mind and change your life! Do you have problems with being postitive? What are you doing to overcome it? What has been your biggest hurdle with being positive? Share what you are doing to stay positive. Let me know in the comments below. Is Being Consistent A Big Problem For You? We know that being consistent plays a major part in our success. 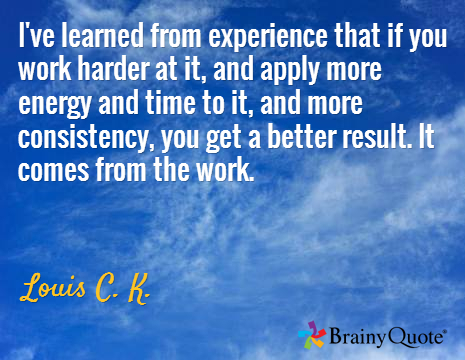 We also know that being consistent is the key but yet sometimes we fail at this most obvious task. It can be hard to keep doing something day in and day out. Doing something over and over again. It gets boring after a while, especially if you don't really like what you're doing. Consistency, and your lack of it can undoubtedly be the reason for your not attaining the success that keeps eluding you. Most people have been a victim of inconsistency (I know I have). I believe it also has been the culprit of why I wasn't achieving my goals. I can't keep looking back though. I have to look forward and where I want to go. The would've, could've, should've isn't going to solve anything. Why, was I so inconsistent? One of the reasons is I believe I was looking at what someone else was doing and not really focusing on what I should have been doing. That's why I always say now that you have to do what's best for you. I have learned that you have to work with what you have and use the tools that are best for you. I am doing that now, but it has cost me some time. I would have been farther in my blogging/internet marketing had I did that earlier. I put myself on a schedule. You can read about it here: "How To Schedule Your Time Successfully". This keeps me on my toes and I get a lot of things done no matter what. Inconsistency can creep in as excuses too. So, you have to be on the lookout for that as well. Laziness can also come in the disguise of inconsistency. You can come up with a million times why you can't do something or why you don't feel like doing it. This, is in fact the epitome of inconsistency. If you see it immediately combat it. Just get up and do it and get it done and out of the way. That way even if you really don't enjoy doing it, or don't feel like it's done. I want to talk about a little bit more about being inconsistent because you feel like you don't have all the tools and resources you think you should have. Is that a reason why you haven't started something or you have been so inconsistent? Or you have been listening to someone tell you that if you don't use abc or xyz you might as well just throw in the towel? I have also learned that you don't always have to explain why or why not you are using something. If it is working for you then keep doing it and if you find that you want to change later you can always do that. The reason I say this is because those feelings of being inadequate can make you become inconsistent and once you have these feelings it makes it easier for you to keep doing it. The saying,"If you like it I love it" is so relevant, because if you really do people will too. I'm going to use this as an example. I have been told many times that I should use Wordpress. I don't have anything against Wordpress. I think all the bloggers blogs that use it are very nice and they look very professional. However, I am using Ucoz. Why? Because it is best for me at this moment and on top of it. I really like it. Should I just stop blogging because I am not using Wordpress? Or should I have never started blogging to begin with because I wasn't using Wordpress? I don't think so. The goal is to stop being inconsistent and start being consistent, but that won't happen if you don't get to the root of the problem. So, if you have these feelings or have had these feelings in the past just know that they are really are just problems of being inconsistent. Don't dwell on them and keep moving. I am truly writing this from experience. I have had big problems with not being consistent. All of the above I have experienced. I'm not one not to admit my problems, because I truly want to rectify them and it won't happen if I don't admit them. The good news is I have gotten better. So, what was the final breaking point for me. I really wasn't achieving my goals. I would start out strong, then little by little I would get less and less done. Also, me being a quiet/introverted person I had to really work on my self confidence. I had to stop taking everything so seriously. People say what they feel they need to say. You can't take it to heart. They may or may not be talking about you. What I've learned is they are really talking about themselves and cover it up like they are talking about someone else. Which many times you think it is you. Having a daily self improvement plan is a must. You will find this blog post,"Easy Self Improvement Tips That You Can Put Into Practice Today" to be helpful. Doing something over and over and over again can be quite challenging sometimes but I think you know that if you keep at it you will get the results that you desire to have. Slow and steady wins the race. Have you had problems with being consistent or do you still have them? What was your motivation to stop being inconsistent and start being consistent? Are you happy? This is a question that everyone has been asked at least once in their lifetime. There are many things that we can be happy about. What is happiness to you? It can be many things. Also, there are many things that can cause you to feel happy. One of those things is when your business is doing good. However, there are things that can cause you to feel unhappy and one of those things is when your business is not doing good. We want to feel happy and more importantly we need to feel happy. When we are feeling depressed and unhappy it is hard for us to achieve what we want especially in our business. However, sometimes that can be extremely hard. Maybe we checked our blog/website's stats and we saw no one was visiting our site. We have written very good blog posts and no one is reading or sharing them. We wrote a review and no one purchased the product that we wrote about. These things can really result in our happiness to be at an all time low. Some people say, "Just focus on the positive". However you and I both know how hard that can be sometimes when you are not getting the results that you would like to get. If we are not careful it can even be the reason for us not moving forward in our business or even quitting. I know many of you can relate to these feelings. For many of us we need some kind of help and it would be nice if you could get it on a regular basis. Something that can help us stay focused. Something that can help us see how happy we are today. You can measure your happiness and track your progress to build your happiness and level skills up. Tracks are designed for different life situations. Activities in your track will be unlocked daily. Earn your achievements - "Happify it!" to make it count. Earn achievements on Happify and improve your life. I have been using Happify and it is a lot of fun! You can choose to share your activities with everyone or keep them private. If you choose to share other members can comment on them. It's a great place to also interact and see how other people are staying positive and also get support. Happify is free but they do offer a premium account. Monthly is $12.95 per month, Yearly is $5.95 per month and Two year is $3.95 per month. This is where you can interact with other members posts and tracks. This is a great way to hold yourself accountable for your own happiness. It keeps you on track and keeps stay focused on being happy. As you can see staying happy and positive is one of the essentials of being successful. This is something that we have to do regularly and on a daily basis. We have to do things that will help keep us on the path of positivity. When you feel good you do good and when you feel bad you do bad. Keeping a journal can also help you feel good and at the same time it keeps your mind stimulated. Make sure you write down all the good things and accomplishments you have made. If you have experienced anything good or made any big strides in your business. Make sure you write it down. Don't forget to be grateful. Write down all the reasons you have to be grateful. You will feel a lot better and it makes staying on the path to happiness a whole lot easier. Don't have a journal and would like to start keeping one? Go To How To Keep A Journal and read up on the benefits of keeping a journal. Everything depends upon how we feel. So, let's start feeling happier today! We've all heard it before the way you think is what manifests in your life. Is this something that we truly believe? Can it really be that easy? Many times we tell ourselves that it can't be. With that thought in our minds we have already set the precedent that it can't be and it won't be. When in fact it really truly is. We have all been guilty of having a negative mindset at one time or the other ( I know I have been). We have to reverse this negative thinking and we have to do it fast. Why? Because it stopping us from being all that we can be. The question we ask ourselves is, "How can I go about getting rid of this negative mindset?" It is nothing wrong with getting help. The Magic Of Thinking Big is definitely the help that you need to change from negative to positive so that you can start achieving the things that you would like to do. This is an excellent book! I am reading it again for the third time. It has helped me overcome my fear of people (as I used to be very shy). I was so shy that sometimes I wouldn't ask questions or I would never be the first one to introduce myself. Once I started utilizing the instructions in this book it went away completely. This book is a guide to help you overcome negative things that have held you back for so many years. In this book you will not only get results it gives you step by step instructions that you can put into practice. In it there are situations that everyone can relate to. Dr. Schwartz gives you checklists that you can use to help you identify the problem and gives you the solution you need to solve it. That's why I absolutely love this book. 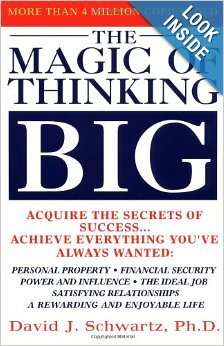 Sometimes you read books but they don't give you a solution to your problems but The Magic Of Thinking Big does. You might be thinking, "How can this book help me because I am an internet marketer/blogger?" It can help you have the mindset that you need to have in order to be successful in what you do. No matter what business you are in you have to stay motivated and stay positive. You also have to be confident in what you do because there are many people who would love to help you give in to negative thinking. In a chapter of this book is called," Cure Yourself Of Excusitis, The Failure Disease". In it he discusses people who are always making excuses not to do things and because they always have an excuse they don't get anything done. Maybe we all have made excuses not to do something at one time or the other or we know someone who is always making excuses not to do something. He also helps you combat it and how to avoid it altogether. We have all had times where things may not be going like we would like them to and in those times it can become easy to fall prey to negative thinking. The Magic Of Thinking Big will help you get through those tough times and keep you focused. Have you read,"The Magic Of Thinking Big?" If you do not have a copy of this book I suggest you Click Here and get your copy today! This is a book that you can use as a reference and read over and over again! It can really help make a difference in your life! It has definitely made one in mine!